I’d been looking forward to the Dad 2.0 Summit for months. But also because, the Dad 2.0 Summit exemplifies what it means to engage an army that successfully fights for a cause. After I checked into my hostel (yes, people over 50 still do things like this), I jumped on a streetcar and headed down Canal Street filled with anticipation. New Orleans is one of my favorite cities – a true testament of resilience and soul. I love how different forms of music flow down every avenue. Kids with upside down 5-gallon buckets drum their hearts out on the curb. Blues and jazz and country and rock emerge from gas lit alleys and crowded clubs. The sweet perfume of pralines and beignets intermix with fried oysters and chicory coffee with some subtle under-notes of stale beer. Gold, purple and green beads sparkle in piles line the streets and drape in layers over necks and wrists. 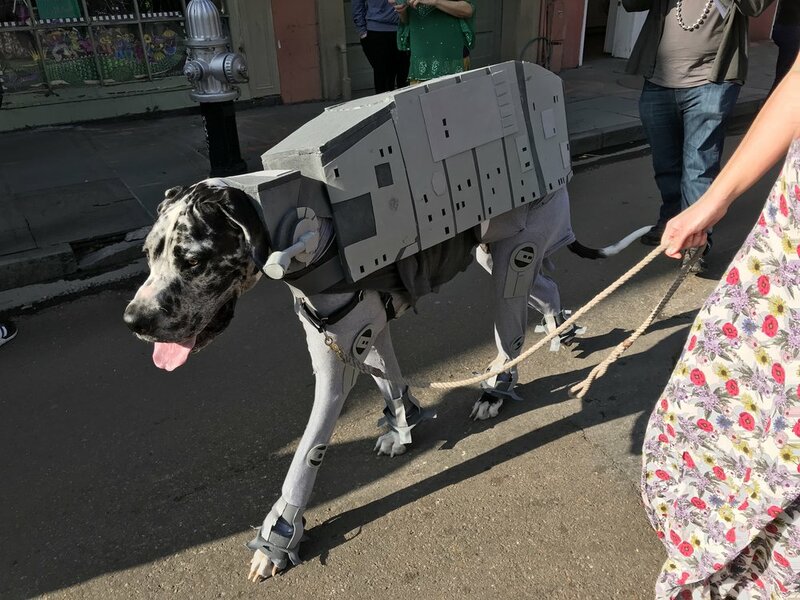 Masks and boas and outrageous costumes – even a dog parade – provide endless smiles. The exuberance and celebration continue at an on-going high pitch, day and night. Rain and shine. But the trip wasn’t all gumbo and sazeracs. We had important work to do. This Dad 2.0 Summit was my third. In 2014 and 2015 I attended and gave presentations on what was then the new Man Therapy program. The Summit participants loved the humor and high quality production of the campaign. This year the relationships and opportunities of the Summit surpassed expectations. The attendees at the conference are largely fatherhood bloggers, podcasters, and video creators. They are highly effective communicators who share stories of everything from perfecting the art of lunchbox notes to raising kids with special needs to “ending the chain of pain” by overcoming childhood trauma and much more. All of their content is aimed at improving fatherhood. These guys inspire me. They are thoughtful, articulate, and passionate about being dads. When they come together they are a force with which to be reckoned. And that was exactly the mission the founders envisioned when they started the conference seven years ago. They were frustrated with how dads were being portrayed in the media as bumbling, absent and clueless, so they decided to leverage the power of dads’ stories and connectedness to create systems and cultural change. Sound familiar? If you have been reading my previous entries or following our new nonprofit United Suicide Survivors International, it should. It is our belief that the stories of hope and recovery from people with lived experience with suicide move hearts and challenge minds. The Dad 2.0 Summit has been working this magic for their own cause for nearly a decade. The design of the Summit is genius. They bring together highly effective influencers and major brands – like Dove Men+Care, Clorox, Best Buy, Kia, Hanes and Lego to collaborate and use the power of advertising to paint healthier images of fathers. As I sit here in the airport waiting for my flight home, I am watching the beginning of the Patriots versus Eagles Super Bowl, and I am reminded of the Dad 2.0 Summit effectiveness. In 2015 the Super Bowl aired several commercials that portrayed fathers as loving and engaged co-parents. 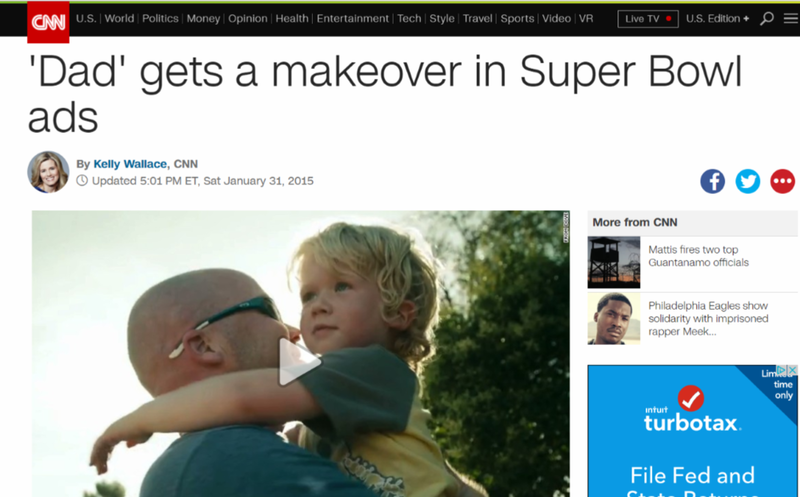 CNN called it the “makeover for Dad” and covered how the bloggers and Summit impacted the biggest platform of advertising we know. 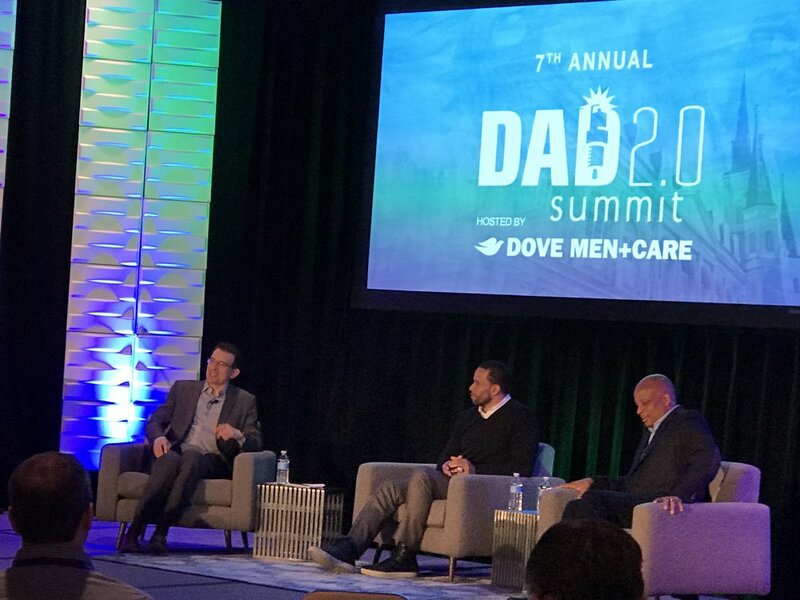 This shift in marketing, led in large part by Dove Men+Care and the folks involved in the Dad 2.0 Summit, is one example of the powerful way this collaborative effort has shifted collective consciousness. The mental health and suicide prevention community can learn a lot from their success. At the Summit, the presenters hit the hard topics: #MeToo and #TimesUp, concussions, paternal leave, racism, and the future of education, to name a few. On this big football weekend, four NFL players (Ronnie Lott, his son Ryan Nece, Eric Capers and the ONE AND ONLY Von Miller (#GoBroncos #KingOfChickens) spoke to the attendees about fitness, fatherhood, and sweat equity. We also learned more about how to leverage storytelling and content sharing through platforms like Twitter, Podcasting, YouTube, and Instagram. Let me tell you, the mental health promotion and suicide prevention world could take a few pages out of these dads’ playbooks. They are operating on a whole different level to challenge stigmatized ideas by engaging the masses. By far, the highlight for me was bringing the topic of men’s mental health to the members of this community and watch folks light up. Joining me were three of the authors of our men’s anthology project “Guts, Grit and the Grind: A MENtal Health MANual.” We presented a breakout on how to write a nonfiction book that helps advance a cause. It was the first time these men had shared their stories in such a public way, and I was so enthused to see how warmly they were received by the conference attendees. On a couple of occasions the influencers reached out to interview them, and together we will open new dialogues on recovery. 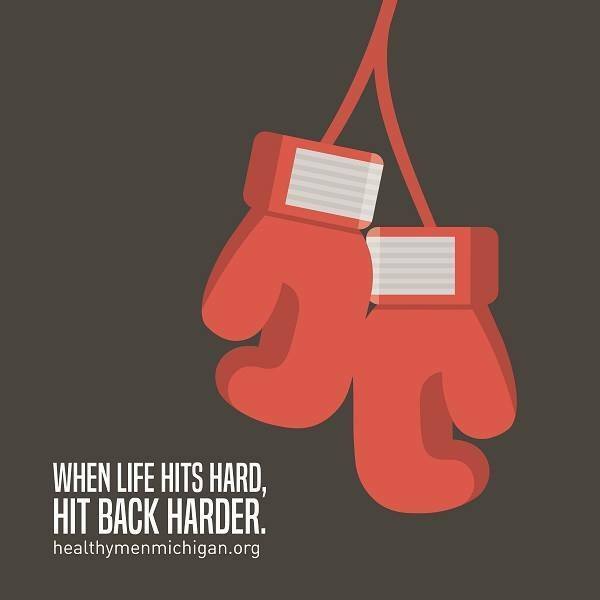 I was excited to see how many attendees gravitated to our “Man Therapy” (www.ManTherapy.org) and “Healthy Men Michigan” (www.healthymenmichigan.org) programs. New partnership opportunities emerged over every cup of coffee. Many lengthy conversations with the National At-Home Dad Network, City Dads Group, and Life of Dad groups have me thinking that something big for men’s mental health may be just around the corner. So, I am hopeful. When this type of might in influencing leans in to a daunting topic like men’s mental health, a profound shift in perspective is possible. Let’s see how we stir things up together. Feel free to share these graphics. All we ask is that you reference www.SallySpencerThomas.com and this blog.